NEW ARRIVAL! Fleur collection From £20 at Gymshark Get tough with your training in the new Fleur collection at Gymshark. Accessories From £5 at Gymshark - Bags, Bottles and Clothing! Find everything you need to be the best at the gym. Women's New Releases From £12 at Gymshark Check out the latest gym clothing releases from Gymshark. Men's Base Layers From £20 at Gymshark With moisture-wicking technology, Gymshark base layers ensure flexibility at comfort throughout your work out. Free Returns on Orders at Gymshark Changed your mind? No problem, get free returns at Gymshark. Discover Bags From £5 at Gymshark - Perfect For All Your Gymwear! Carry all your kit to the gym in style with gym bags from Gymshark. Sports Bras from £20 at Gymshark Get the support you need, see the different styles of sports bras at Gymshark. Gymshark started in 2012 when teenager Ben Francis and his school friends began screen printing in their garage. 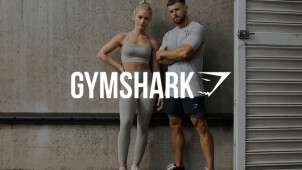 Now one of the biggest and best-loved brands in fitness, Gymshark serve customers in 131 countries and are followed by over 3 million fitness fans across social media. Famous for their exciting collections, such as Seamless, the performance knit that works with your skin, Gymshark continue to bring out new collections that inspire and motivate their customers to be the best. The DRY Moisture Management range keeps you cool during your workout and manages your body’s moisture so you can focus on pushing yourself. The Legacy range brings you timeless, classic editions of their clothing that changed performance wear, great for those working hard in the gym and out of it. Gymshark has grown to cover every aspect of workout clothing, from underwear t outerwear, and even stocks a great range of accessories so you can take your love of their brand wherever you go. Sign up to the mailing list at the bottom of the page and save 10% on your next order! Can I get a Gymshark student discount? Can I get Gymshark free delivery? Yes, when you spend over £35. Gymshark hasn't currently got any physical stores, so it sells exclusively online, which is where you are guaranteed to find the best Gymshark Black Friday sale, year after year. Can I get a Gymshark gift card? Yes! They sell them here. Item must be returned within 30 days from the day you've received your order, transit times are not included within this time. Items must be unworn and unwashed. Does not include underwear or socks for hygiene reasons. Terms apply. Get moving and stay cool with Gymshark, an exciting, dynamic name in the world of fitness clothing. A Gymshark discount code could save you money on your next purchase, leaving you more in your pocket to spend on that new fitness program. With a great selection of hoodies, tees, leggings, sports bras and more, Gymshark has all you need to keep you comfortable in the gym so you can focus on your workout and achieve your fitness goals. Gymshark’s hoodies are renowned in the industry - and for good reason. Whether you’re keeping it indoors or venturing outside, these won’t let you down. Dynamically designed and always high quality, a Gymshark hoodie guarantees comfort and protection. Their range of styles brings something to suit anyone, no matter how you like to workout. You no longer have to choose between style and performance: Gymshark’s hoodie range guarantees both. Bring some game to your outer layers with a Gymshark hoodie today! If you’re heading for the gym then congrats to you! Time to reward yourself with something from Gymshark’s Seamless range: an innovative new development in activewear, fitting your skin perfectly for an almost weightless feel. This range is an absolute must have for gym-goers, and a Gymshark voucher code could cut the cost of your next purchase, meaning you can put more into your training equipment or new gym membership. The Seamless range of tops and bottoms for men and women means everyone can enjoy the supreme comfort and maneuverability of one of Gymshark’s top selections.